Gambia having over 1.62million Muslims out of 1.8million population. Gambian President Yahya Jammeh AP declared it territory an Islamic republic to be liberated from it's colonizer. kilometers west of the capital, Banjul. "Gambia cannot afford to continue the colonial legacy,"
the jihadist organization known as Isis or Boko Haram. respect the rights of all citizens and non-citizens." criticized by Britain and other Western world powers for injuring human rights. 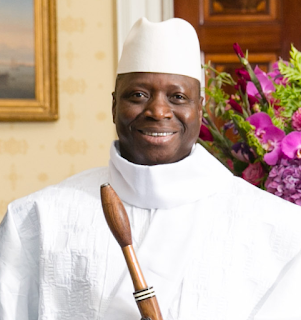 President Jammeh has been in power for over 20years since the seizing of power in 1994.